This year we were fortunate to grow pumpkins in our backyard. It was wonderful for the boys to watch small seeds grow to large pumpkins. Plus, our front porch looks gorgeous this year with all of our homegrown pumpkins. We've read about the life cycle of a pumpkin in two of our favorite fall books, "From Seed to Pumpkin" by Wendy Pfeffer and "Pumpkin, Pumpkin" by Jeanne Titherington. It was fun to finally see that process in real life. After observing our pumpkins and reading about the life cycle of a pumpkin, we created a pumpkin life cycle craft. This was a part of our pumpkin unit. 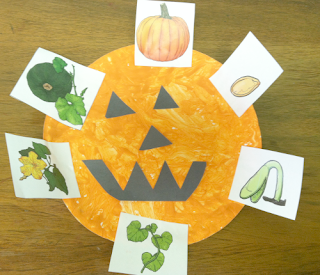 From Seed to Pumpkin is a informational text about the life cycle of a pumpkin. It can be found in the Common Core State Standards Exemplar Texts. The book follows the life of pumpkins on one farm. Simple text and clear illustrations help explain basic concepts about plants. Pumpkin, pumpkin by Jeanne Titherington is the story of a young boy, Jamie, who plants a pumpkin seed and observes the lifecycle of a pumpkin. Children can relate well to Jamie as he watches his plant change and grow with hopes of having a pumpkin that is big enough for a jack-o-lantern. 1. Begin the lesson by having students paint a paper plate with orange paint. 3. Read the book, “From Seed to Pumpkin” by Wendy Pfeffer. 4. Introduce the life cycle of a pumpkin to students. Review the life cycle and utilize vocabulary for each stage. (seed, sprout, vine, flower, pumpkin, ripe pumpkin). 5. Check student’s comprehension of the lesson by having the students pictures of the life cycle in the correct order. 6. Have students explain the sequence of a pumpkin life cycle and then glue pictures in the correct sequence around the outside of the pumpkin. 7. Allow student to create jack-o-lantern faces for the pumpkin. If you would like a pre-made set for this lesson, you can get it in my Pumpkin unit in my teachers pay teachers store. We also read the book "Pumpkin, pumpkin". I created some story retelling cards in my pumpkin unit to review the life cycle of a pumpkin as well as practice sequencing a story. This is a great way to focus on beginning, middle, and end of a story. Provide printed story retelling strips. Work with the child to read the descriptions and have the child sequence the cards. 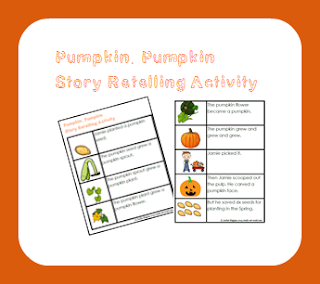 A pumpkin unit can be a fun way to explore the science concept of life cycles. Exploring life cycles leads to a natural discussion of sequencing. Thematic learning is sure to occur when you explore pumpkins. Plus, your kids will be really happy to do the exploring! I love the pumpkin life cycle ideas! Our kids loved watching our pumpkins grow in our garden this year. However my husband decided to cut a few life cycles short when they were overtaking the rest of the garden :) Thanks for sharing at After School! Hi Jackie. I love how you incorporated your lessons with printables. Your boys must have really enjoyed watching them grow. So many wonderful lessons too. Thank you for sharing on our page.